About 17 injured in a road accident Mar. 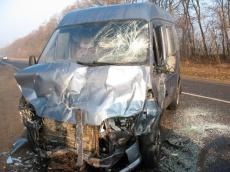 9 morning on the Baku-Sumqayit highway were placed in the Sumqayit State Hospital, and four injured were taken to the Baku Clinical Medical Center, two of them are in serious condition, Safaya Ahmadova, head of the press service of Azerbaijan’s Health Ministry told Trend. One of the injured died right after admission to hospital, she said. Of the number of injured taken to the Sumqayit State Hospital, three were placed in the hospital’s traumatology, six in the neurosurgery, three in the surgery department, two in the intensive care unit, and two were rendered outpatient care. Three injured (two from the Sumqayit City Hospital, one from the Baku Clinical Medical Center) were released home. Safaya Ahmadova added that currently, the leading specialists of Azerbaijan’s Health Ministry have been sent to the hospitals. 11:16 (GMT+4) The number of victims in a road accident Mar. 9 morning on the Baku-Sumqayit highway has increased to five, the Azerbaijani Ministry of Health told Trend. About 20 passengers received injuries and have been taken to hospitals, according to the ministry. The wounded are in fair condition. 10:15 (GMT+4) At least three people died and five received different types of injuries in a road accident Mar. 9 morning on the Baku-Sumqayit highway, Kamran Aliyev, head of the Public Relations Division of the Main Traffic Police Department of Azerbaijan, told Trend. The Ford Transit bus en route from Baku to Sumqayit city collided with a truck, Trend’s correspondent reported from the accident scene. The bus was transporting students of the Sumqayit State University.